The first jazz standard lesson in the PianoGroove course is Miles Davis’ ‘Tune Up’. 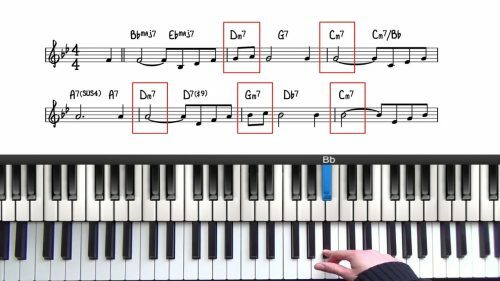 This lesson provides an introduction on how to read lead sheets for jazz piano. 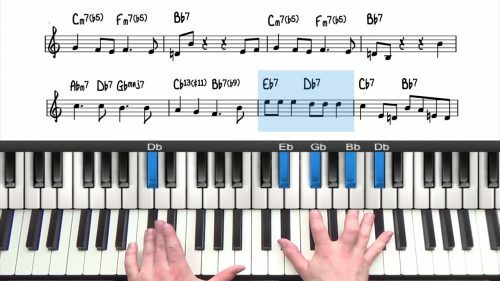 It’s a great tune for beginners because the form is short and there are a number of major 251 progressions for applying basic jazz theory. Unlike classical piano notation, lead sheets usually just contain one stave of music containing the melody. The chord symbols are notated above the stave to indicate what chord should be played. We apply some of the basic theory: major 251s, chord extensions and we touch upon chord alterations. Don’t worry if something in the lesson does not make sense. This is a good thing because it means you are exposing yourself to more complicated topics. It will make sense with time. In a minor 251, the 5 chord will be an altered dominant chord. In this lesson we apply altered dominant chords to the major 251 progression. We explore voicings for each note of the dorian mode. Watch this and never again get stuck on what to play for minor chords! Introduced by the pianist Bill Evans, the ‘So What’ chord is a minor 11th voicing that sounds great over minor chords with the 5th in the melody. With each chord you play, look at the individual notes and say 'that’s the root.... that’s the major 3rd.... that’s the 9th etc…’ this is important. This is important to develop an awareness of the chord tones and scale degrees of harmony. In this lesson we do reference some more advanced jazz theory. Don't worry if this doesn't make sense right now, the full understanding will come with time.